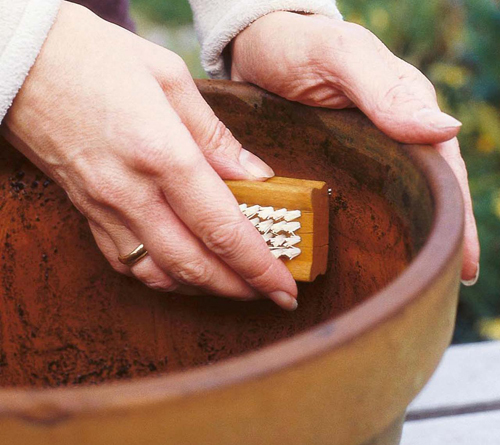 Here are some tried and true planter tips that really help. Check them out and let us know what you think. Always check you garden containers for drainage holes. 99% of the planters we carry have hole in them when they are produced but we offer a few styles that do not. If you purchase a pot that doesn't have a drain hole you will need to make some. 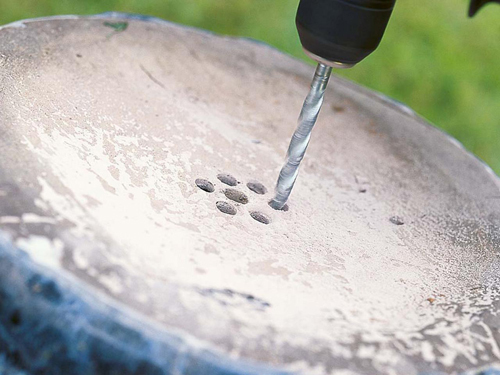 Using a masonry drill bit you can drill any pot we offer, including our concrete. Stop the rot. To help water drain freely, place broken terracotta pots, pot filler, or large pebbles in the bottom of your garden pots. You can always put fine mesh or gravel on top of the filler to prevent the drain holes from becoming blocked. All plants need good drainage. If the root system sits in standing water, they will rot and the plant will not survive. Reusing old pots is a great way to save money but you should make sure they are cleaned properly. Stored pots can be a breeding ground for pests and diseases. Don't risk not cleaning them. Use a scrub brush and use warm water & and detergent. Make sure you rinse well. Soaking garden pots in a mild bleach solution and then rinsing works well also. 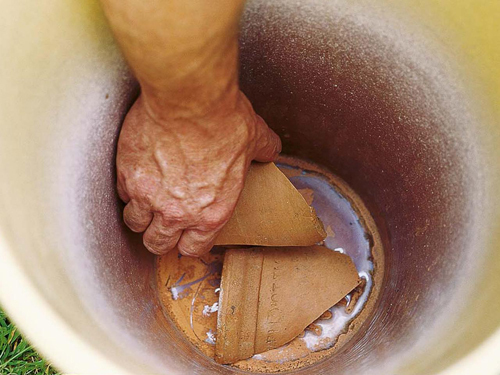 Clay pots that are not glazed are porous and when filled with water the water will freeze and expand, causing the pot to crack. Line them with a heavy-duty plastic. Place a layer of pebbles in the base and fill with potting mix. Use scissors to cut drain holes in the bottom. Trim the excess at the top. As you can see, by taking a few simple steps you can create lovely potted containers.